The banner o Kyrgyzstan wis adoptit on 3 Mairch 1992 bi the Supreme Council o Kyrgyzstan. It consists o a reid field w a yellae sun in the centre haein 40 uniformly spaced rays. In the centre o the sun is a reid ring crossed bi twa sets o three lines, a stylized representation o the tündük (Kyrgyz:түндүк}}, tyndyk) or croun o the traditional Kyrgyz yurt, a seembol replicatit in mony facets o Kyrgyz airchitecture. The reid backgrund o the banner seembolizes bravery an valor, the sun represents peace an wealth, an the tunduk signifies the faimily hame or, bi extension, the universe. Accordin tae popular interpretations, the sun's 40 rays represent the 40 Kyrgyz tribes unified against the Mongols bi the epic hero Manas. 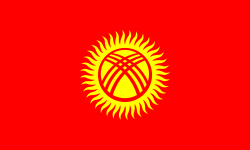 Wikimedia Commons haes media relatit tae Flags of Kyrgyzstan. This page wis last eeditit on 2 September 2018, at 20:15.